If you are looking for the perfect tires for your Audi vehicle this winter or summer, come to Bill Matthews Audi today. Our tire experts know what tires are best for your Audi, and they will take the time to understand your lifestyle and how you plan to use your vehicle in order to recommend the very best seasonal tires for you. At Bill Matthews Audi, we have the winter or summer tires you are looking for at competitive prices. We have everything you need under one roof, and we can even install your tires and store them on site in our climate-controlled facility. When it comes to tires for your Audi, trust the experts at Bill Matthews Audi. We also have plenty of rebates and seasonal promotions on hand and waiting for you at Bill Matthews Audi. You are not only getting a wide range of tire options for your vehicle when you visit our tire centre, you are also getting dedicated staff and more value for your money. 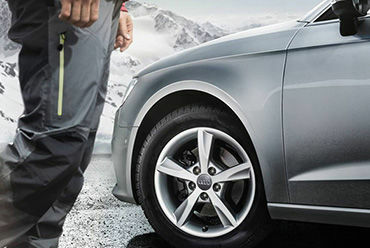 Visit us today and discover our complete inventory of winter and summer tires for your Audi.